Nonsuch Mansion is located in Nonsuch Park, less than 30 minutes from Central London by rail or road. 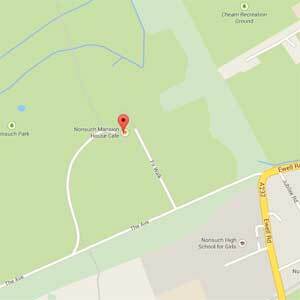 Please make sure that yourself and your guests use postcode SM3 8AP to find us which will take you to the CHEAM GATE entrance of Nonsuch Park. Don’t believe your satnav if it says you can drive through the park to the mansion via the North Gate car park – you can’t! Also ignore all brown signs – they too take you to the wrong side of the park.